Fans of the Donmar Warehouse production of Lynn Nottage's Sweat, which notably won the 2017 Pulitzer Prize for Drama, shall be pleased to find that many of the original Donmar cast are set to reprise their roles for the highly anticipated West End Gielgud Theatre premiere. Tickets to Sweat in London's West End are on sale now. 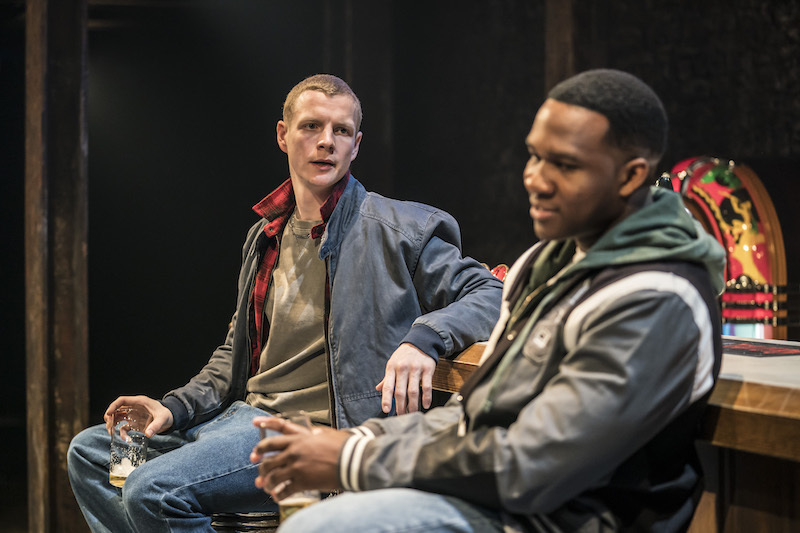 Patrick Gibson and Osy Ikhile in the Donmar Warehouse production of Sweat. Gibson has not been confirmed to be returning for the West End run. In a special announcement made today, it was confirmed that most of the Donmar Warehouse cast of Sweat will be starring in the West End transfer. Returning for the six-week Gielgud Theatre run will be Clare Perkins as Cynthia, Leanne Best as Jessie, Martha Plimpton as Tracey, Osy Ikhile as Chris, Sebastian Viveros as Oscar, Stuart McQuarrie as Stan, Sule Rimi as Evan, and Wil Johnson as Brucie. The idea behind the striking drama, Sweat, was first conceived in 2011 by American playwright Lynn Nottage during her interactions with the citizens of Reading, Pennsylvania, a city that is ranked as one of the poorest cities in America with approximately 26% of the population below the poverty line. Within the next two years, Nottage further investigated the impoverished region of Middle America where racial tension runs high and industry has collapsed. Her experiences eventually drove her to write a play on her experiences. Sweat focused on the relationships between small-town factory workers and takes place in a classic American bar. The high-tension drama explores the human condition and their reactions and fears resulting from de-industrialisation in their community. Interracial conflicts and bubbling anger abound, resulting in a cataclysmic outcome for Reading, Pennsylvania residents. Get tickets for Sweat at the Gielgud Theatre from just £18! The cast and creatives have put in their blood, sweat and tears to create this fantastic West End production. With just 50 performances and low prices, Sweat Gielgud Theatre tickets will not last! Book your seats early to avoid disappointment! Purchase your Sweat West End Gielgud Theatre tickets from £18.